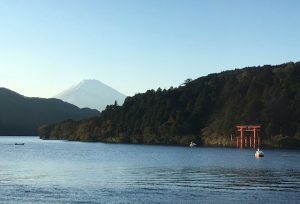 In the course of seven trips to Japan, almost nine months’ worth of total time in-country, and over 60 visits to various sites which claim to have views of Japan’s most famous peak, Fujisan has continually rejected my attempts to view it personally. – which had disappeared behind clouds by the time I woke up for real at 7. 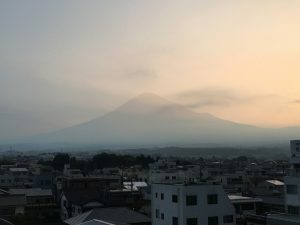 The morning dawned bright and clear, and though I hoped for a glimpse of Fuji, I wasn’t putting any eggs in that particular emotional basket. 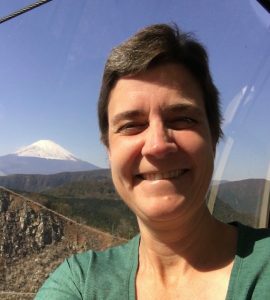 We rode the electric train to the cable car, then boarded the gondola, and headed up to Owakudani, the volcanic crater from which Fuji can allegedly be seen. I fell in love with Fujisan as a kindergartener, the first time I ever saw a photograph of its iconic peak. For 47 years, I’ve longed to have the chance to really gaze upon it – really see it, rather than merely catching a glimpse from a moving train. 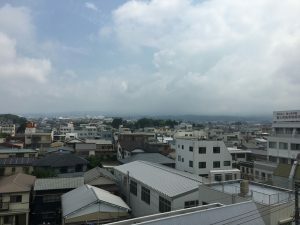 Although I’m not superstitious, I’d begun to wonder whether the mountain was waiting for me to make the effort–and the pilgrimage–to climb to the summit before allowing me a view of its famous peak. 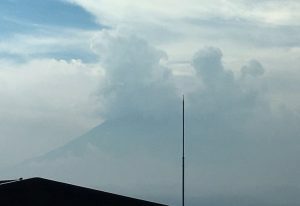 This was my first visit to a Fuji view spot after climbing to Fuji’s summit last July. Superstitious or not, I think I have my answer.